There are stories that many people love so very much that it doesn't matter how many times we are going to see them presented in this or that way. Three Musketeers Secret: Constance's Mission places you in Constance's place in this beautiful story of danger, love, secrets and adventure. 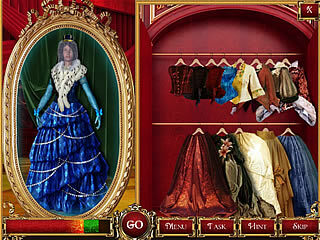 The game is a typical one from the hidden object puzzle adventure genre. You replay the story from Constance’s eyes. And her mission is well known to everyone - to save the queen. She is kind of a secret agent here involved in all kins of intrigue to help the queen and D’Artagnan. 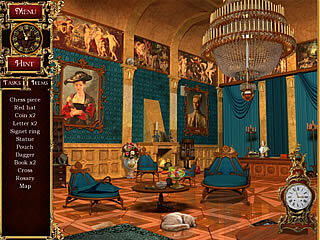 The game is a typical one from the hidden object puzzle adventure genre. There are the hidden object levels every now and then. The scenes there are a bit cluttered sometimes. Some of the items are irrelevant to the story sometimes too. There are no anachronisms though. The game is full of all kinds of puzzles. And that is nice to have many of them to play for a change. Those are not extremely challenging as well as the rest of the game. The hints work perfectly for the hidden object levels, but they are not as clear for the adventure part of the game. The game is good enough in some of its features, but there is a lack of other ones at he same time. You get a great intro to the story, but it would have been so much better with the voice-over. More than one mode would also be appreciated by many. Maybe it is better to try the free version to make sure that the game is what you are looking for in the hidden object puzzle adventure games. This is Three Musketeers Secret: Constance's Mission review. Download this game here.